It's high school meets nature documentary in this new shojo comedy! Kanoko Naedoko, a third-year student in junior high, doesn't make friends and keeps to herself. Which is fine by her because then she can be the ideal "objective observer." Steamy love triangles, school gossip and courtyard politics only mean more data for Lady Kanoko! But when she befriends some of her classmates, what will happen to Kanoko? Will she become more than just an observer? 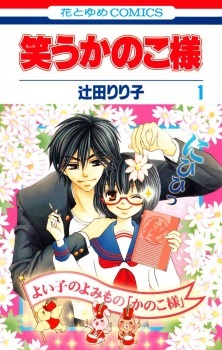 Warau Kanoko-sama was published in English as The Secret Notes of Lady Kanoko by Tokyopop. Due to the publisher's ceasing of operations on North America, only two volumes were published from August 5, 2008 to February 2, 2009. The series was also published in Polish by Studio JG from July 17, 2015 to February 5, 2016. Warau Kanoko-sama is probably one of the few shoujo manga that I can say I thoroughly enjoyed. I have to say that I absolutely adored the main character, Naedoko Kanoko. Unlike a lot of the shoujo protagonists out there, she was completely refreshing and unique for a protagonist - not just for the shoujo genre, but any genre in general. She may be introverted, but by no means does that make her shy or meek. She's also very clever, independent, intelligent, and strong. Most importantly, she manages to stay true to herself, which I loved, because I've seen many protagonists change because of a romance. I also really appreciated the story. Although the story is episodic in nature, I like how the story didn't focus on a typical shoujo romance, but instead the characters, which I think should happen more in shoujo manga. Even if a character was only present in a single chapter, I still felt that I got to know that character. Most of all though, I really liked the idea that the protagonist wasn't directly involved in situations, but rather, observing the situation. This might not be everyone's cup of tea, especially if you're in it for the romance. But if you're up for a refreshing read, then you should definitely check this one out. All in all though its worth checking out! I absolutely love this manga. What I love most about it is the main character. I like how strong her personality is. When she's ostricize and made fun of by her classmates, she could care less and doesn't cry and complain like so many other girls would. She doesn't take BS from nobody and sees straight through fake people. She doesn't sugarcoat things, prefering to tell people exactly what she thinks of them. Though she's a loner, she enjoys being one and goes so far as to make sure it stays that way. However, when someone does decided to truly be her friend, she sticks up for them in tough situations and helps out those who don't deserve to be in bad situations. The romance is a bit slow for a shoujo manga, but I like how its focus is on Kanako's observations and how she uses the information she collects to help other people or to make things more "interesting." That type of focus on a character's actions is quite rare. A lot of shoujo mangas start out with its heroine focused on her job but then deviates and becomes more focused on love. It's not a bad thing for a shoujo manga, but it would make the reader wonder what happened to the heroine's enthusiasm for her work. However, Tsubaki's role is also more reduced than what a normal love interest's role is usually like, but it makes one appreciate his appearance and what he does for Kanako as she transfers from school to school. This manga reminded me a lot of Gokusen with its slow romance and (again) its focus on the job. But it also makes me appreciate and look at things in another way.